As with public transportation in most major cities, there are peak times of travel on the London Tube that you really should try to avoid during your trip. These times are when the massive transit network known as the tube is at its maximum capacity, and travelers are often forced to squeeze into the last available spot on a cramped train. So really, it's not to be recommended. The lines that travel through popular tourist and entertainment areas—like the Piccadilly, Northern, and Central Lines—stay busy throughout the afternoon. The Piccadilly Line remains busy until about 8 p.m. as people head to the West End for restaurants, clubs, and theaters and has another mini-rush hour when theaters close after about 11 p.m. If you don't like crowded trains, especially avoid the normal rush hours on lines that travel through the main shopping areas of Knightsbridge and Oxford Street—the Piccadilly and Central lines. On most days, the shops close at about the same time as people are leaving their offices. The added crush of package laded shoppers to the normal burden of 9 to 5'ers can be unbearable. Transport for London is coy about breaking down the numbers of transit users line by line, but they publish a station-by-station guide to rush hour and peak travel times for the tube network, and you can also search its website for individual stations to see if they're busy when you plan to leave your hotel for the day. Additionally, The City Metric, an arm of the magazine The New Statesman had a go at doing some number crunching based on the most recent data (from a 2012 report). In their study, they found that the Victoria Line is the busiest in London, but it's mainly reserved for people who commute to downtown London for work. In fact, with the exception of three stops in the middle of the line—Victoria, Green Park, and Oxford Circus—there's almost nowhere of interest to visitors that aren't also served by other lines. In the end, it comes down to personal perceptions and preferences. 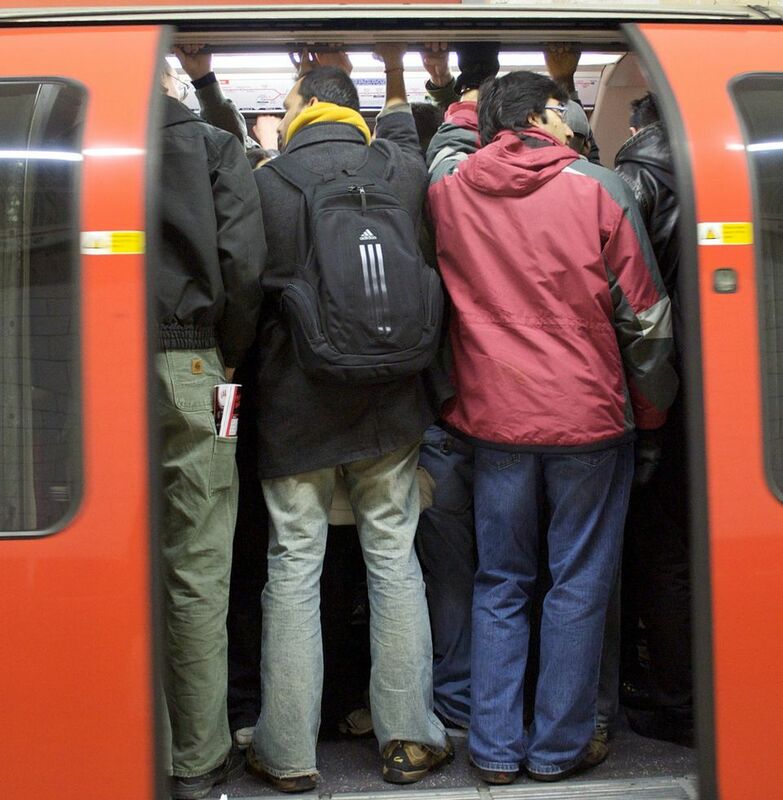 Ask any Londoner and they are sure to tell you that their line is the most crowded during rush hour. If you have to travel on the London Underground during rush hour—and sooner or later, most visitors to London do—there are a few things you can do to make your life easier. First, buy an Oyster card, which is used for all forms of public transportation in and around London including the Underground, Overground, and some rail services, buses (which no longer take cash), and Thames commuter boats. You can purchase an Oyster card from a ticket machine in London and charge it up with cash or your credit card at the same machine. The card costs £5, which can be refunded at a ticket machine, along with any funds still available on the card, when you leave London. Besides saving you a lot of money, just being able to tap in without standing in ticket machine (or the increasingly rare ticket office) queues during rush hour saves a lot of time. For added ease on your transit, charge up your card with credit when you happen to be near a station, even if you aren't planning to travel then. At slow times, there are no queues at the ticket machines. If you have a contactless credit or debit card, you can use it in the same way as an Oyster Card and save time that way. The fares for contactless payments are the same as for Oyster Cards for U.K. residents, but if you are visiting London from abroad, be careful. You may save time but you'll have to pay foreign exchange charges on your card bill back home—so this option is really only useful for visitors from elsewhere in the United Kingdom. Travel delays from engineering works, signal failures, and the occasional, euphemistic "person on the line" announcements can create mini rush hours that clog up the tube. All London Underground stations post signs daily—including advance notices—about station closures, engineering works, and other problems. Stop to read them so you can plan alternative routes ahead of time if necessary (on the London Underground there is almost always an alternative route). A relatively easy way to minimize your exposure to the rush hour crush is to go to the very ends of the platforms when waiting for the next train. Most people gather around the middle of the station platforms, where the stairs or escalators disgorge their passengers. If you walk to either end of the platform you'll find the carriages are usually less packed. Do this even if it means missing a train or two. During the rush hour, there will always be another one along in just a few minutes. If you'd rather not face the rush hour crowds at all and you have to travel at that time of day, there are a few alternatives. London's red buses get busy during rush hour, too, but the difference is that they are legally limited in the number of standing passengers they can take. The driver, who keeps track of the numbers, simply won't allow any more passengers on board if the bus is too full. That may mean that in Central London you will have to watch one or two buses go by without stopping, but it also means you won't be crushed up against a stranger during your commute once you're on board the bus. Additionally, buses travel in special lanes, so they are less affected by rush hour traffic jams and can often get you there faster than taking a cab. London now has Riverbus services along the Thames that are a very pleasant way to travel and that you can pay for with your Oyster Card. Like buses, the boats are legally limited in the number of passengers they can carry. There are piers for boarding at key places all along the river—Westminster Pier, near Parliament; close to the London Eye on the Southbank; by the Tate Gallery and so on. Check their stops to see if one of them might be within easy walking distance of where you want to go. London was the second city in the world, after Paris, to have a public bicycle hire program. At the moment it's called Santander Bikes—for the bank that sponsors them—but don't be surprised if locals still call them Barclay Bikes or Boris Bikes. You'll need a credit card to use on the touch screen at the cycle docking station. There's no need to book in advance, though at busy times you may have to visit more than one docking station to find a bike. When you are finished with the cycle, you simply return it to the docking station and your credit card will be charged for the amount of time you used it—which could be as little as £2. Do be aware, though, that these bicycles were designed to be sturdy and unattractive to thieves, so they are heavier than your usual bike and much harder to pedal. However, the good news is that the system of safe Bicycle Superhighways is expanding every day, making it even easier to get around on a cycle.